Chichester’s Independents. Big Brands, Better Service. We modern shoppers are breaking down some of the old certainties. We don’t have a notion of the seasons anymore, expecting to find anything from food to clothing to gadgets in our shops when we want them and not when nature organises it. The millennials expect to find the latest trends today and are more brand-conscious than any generation before. None of us are waiting around for value any more either. Remember when you couldn’t get a bargain for love nor money before Christmas but had to queue down the street on Boxing Day to snap up bargains in “the sales” too late for present-giving? Nowadays we want value whenever we want it, which is a real headache for any shop owner who sells “stuff”. There’s just not room in our small shops for everything you and I might be looking for, and that lack of availability is driving us to the well-named world wide web, where everything is available all the time, regardless of any of the old certainties like the time of day, fashion, trends, colours, county of origin, the recommended retail price (remember that one? ), the season, the currency, the national border or the fact we live on an island. Well Chichester’s independents have got it all right here on your doorstep and, what’s more, your favourite brands come in two shades at once, all with unrivalled knowledge of the stock, quick turnarounds and unbeatable personal service. Take a winding walk from The Hornet to Northgate and you can buy the following straight up genuine international brands from just sixteen of our 80 plus independent shops: Suzuki, Aprilia, Moto Guzzi, Clothkits, Barbour, Regatta, Hunter, Le Chameau, Gore-Tex, Garmin, Tom-Tom, Adidas, Brooks, Mizuno, Saucony, Hoka, Bosch, Panasonic, Roberts, Smeg, Orla Keily, i blues, James Lakeland, Bazar Deluxe, Crime Sneakers, Hugo Boss, Duchamp, Nicole Farhi, Joseph, Sarah Pacini, Joseph Ribkoff, Cocoa Cashmere, Halston Heritage, Rolex, Tudor, Longine, Royal Crown Derby, Montblanc, Breitling, Omega, Apple, Oscar, Santinelli, Gant, Jockey, Meyer, Cheaney Heritage, R M Williams, Harris Tweed, Geo F Trumper, Armani, Vivienne Westwood, DSQUARED2, Canada Goose, Dormeuil, Bateman & Ogden, Salt, Walter & Herbert. What a classy city this is. And that’s just for starters, because here’s a second side to the branding. 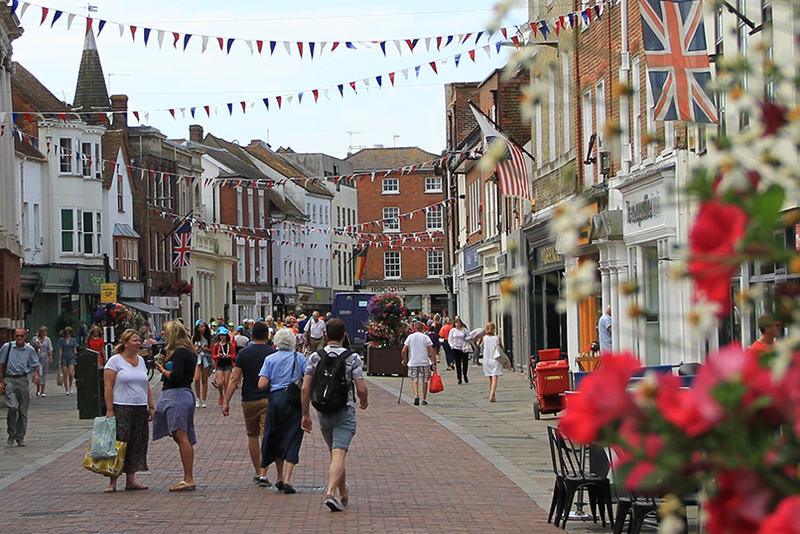 The way the market has shaken down in recent years, many of our independent outlets have become Chichester destination brands in their own right. Walking more or less the same walk as my search for the national brands available from our independents, I found nineteen more independent businesses offering exclusively anything from picture framing, graphic design, craft beers, everything retro or vintage, Vegan food, diamond jewellery, bike gear, exclusive overnight accommodation, the one true Italian Americano, pilates, Soil Association certified organic, real burgers, wooden toys, gelato made on-site with local produce, everything for the musician, everything home-made, well-being food and drink, comics and board games, to interior design. And that’s only 34 of the 130 on-street independents available. Did you spot them? Why not get out there with the independent trails we published last week and get exploring Chichester’s exclusive offer. “Use them or lose them” as we always say.